Driven by the automotive industry’s need to improve safety, reduce vehicle weight and increase fuel economy, the steel industry has developed numerous advanced-high-strength steels and hot-formable steels. Hot stamping with die quenching of boron steels appeared at the end of the 1990s, and since then, the process—also called press hardening or hot forming—has become popular for forming complex, high-strength automotive components, including A- and B-pillars, door sills and bumpers. With so many advantages and very few drawbacks, it is easy to predict that the use of hot-formed steels in the automotive industry, and possibly in other industries, will dramatically increase in the coming years. 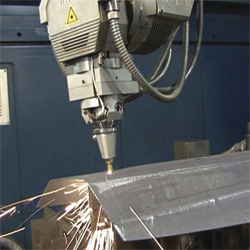 This new type of metalforming requires a new generation of 3D processing equipment for trimming and piercing the hot-formed parts. While traditional mechanical equipment used to trim and pierce the formed parts can result in extremely high tool wear, laser-beam cutting of hot-formed parts, according to Antonio Rotunno, director of technical services for Prima North America Inc., Chicopee, MA, offers manufacturers a to easily and accurately adjust trim lines and feature size or location. And, the thermal reaction required for laser cutting is unaffected by the steel strength. In 1995, Prima installed three of its Rapido five-axis laser machines at SSAB HardTech in Sweden (acquired in 2004 by Gestamp Automacion), to trim hot-stamped parts. Prima also has deployed 3D laser-cutting machines in hot-stamping applications elsewhere in Europe and in North America.